At 5:30 a.m. or so, I took my first real, close-up look at the Joe Paterno statue. 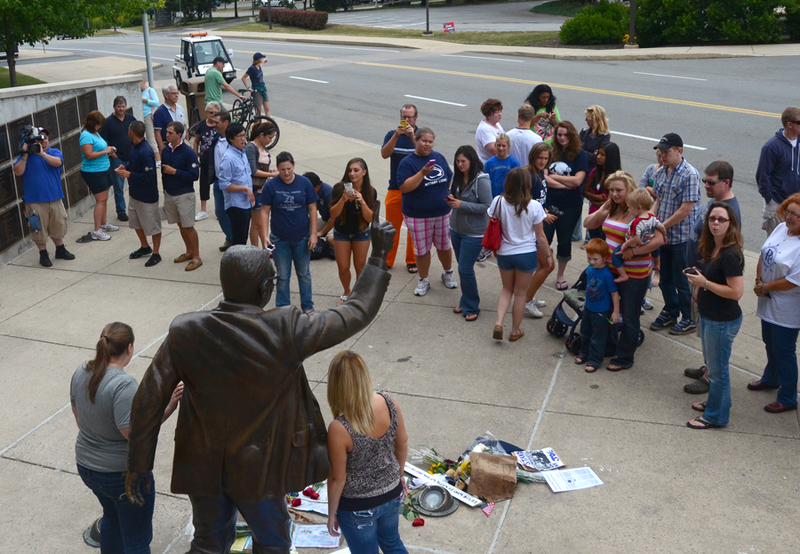 I’d passed it too many times to count; I’d stopped by when Paterno was dying and it was surrounded by mourners. I’d written about it, and its sculptor. But I’d never really seen it. Less than three hours later, the statue was gone. As the wire fence and blue tarps went up around the statue, and then jackhammers pounded, the crowd grew. Most people were townies, and they seemed to come in groups of two or three. Many clutched coffee cups. There were three young women in Penn State cheerleader regalia. A few families. Morning exercisers. I don’t think it ever grew to more than 150 people or so, but it was tough to tell because everyone was so spread out. Some people had tears in their eyes. One woman sobbed. Mostly, it was quiet except for the jackhammers. “It’s just upsetting,” one onlooker said softly. “This is a sad situation,” said another. As an ESPN announcer standing in front of a camera reported Erickson’s statement, one woman standing on the sidewalk quietly booed. One man, standing in the Porter Road parking lot, a little apart from the rest of the crowd, yelled, “Bulldoze the whole place—don’t stop!” The woman who had been sobbing got angry. “I’d better not see you at a game,” she yelled back. A friend wrapped her arm around the woman’s waist, and she didn’t say anything else. The man soon went away. About four people observed the process from the top level of skyboxes; two of them appeared to be Bill Mahon, the university’s director of public relations, and acting athletic director Dave Joyner. 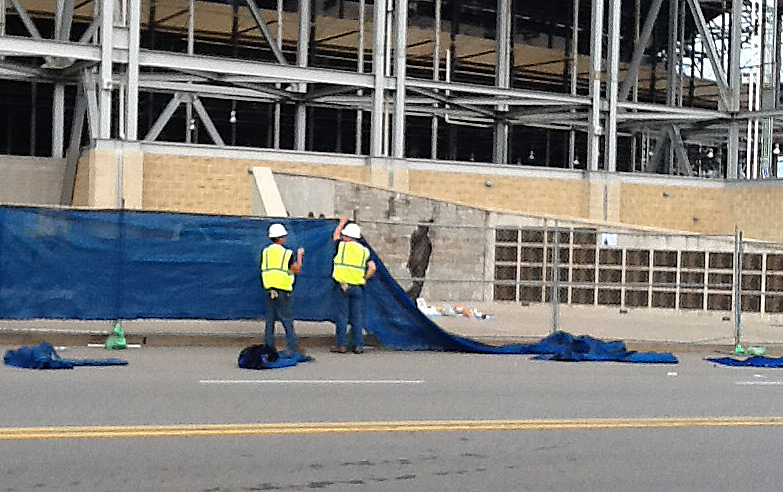 At 8:21, the 7-foot, 900-pound statue, covered by plastic tarp and some kind of blue padding, was lowered to a horizontal position, then moved by a forklift and a phalanx of OPP guys through Loading Dock A and into Beaver Stadium. It was six months to the day since Paterno died; exactly a month since Jerry Sandusky was found guilty. I don’t think I’m the only person who thought the maneuver looked a little like a funeral procession. It seemed that no one knew quite what to do. And then someone yelled “We Are,” and of course the response came back, “Penn State.” After a couple of back-and-forths, someone else yelled, “Joe Paterno forever!” And then everyone began to disperse. The OPP guys spent the rest of the morning removing the rest of the statue’s infrastructure—the plaques with Paterno’s season-by-season records, the quotation (“They asked me what I’d like written about me when I’m gone. I hope they write I’ve made Penn State a better place, not just that I was a good football coach”) and the four football players on the wall. They had some trouble with those. Leaving the stadium, word came through my Twitter feed that the NCAA has scheduled a news conference for 9 a.m. Monday to announce “corrective and punitive measures” against Penn State. Seems like tomorrow is going to be another tough day to be a Penn Stater. They may remove his statue. They can try to erase the physical reminders of his presence. But they can never erase all the great things he accomplished because they are woven within the very fabric that is Penn State and at the core of this University. His lessons we students have learned well: “Losing a game is heartbreaking. Losing your sense of excellence or worth is a tragedy.” We lost the game today with the removal of his statue and this memorial. But we will never lose the sense of excellence or worth that was JVP. WE ARE…because he was. He was human, not a god, and he made a majorly bad call. He knew and allowed heinous acts to continue–he didn’t just ignore what *had* happened, he allowed (along with Spanier, Curley and Shultz) *more* heinous acts to happen after they turned away. This blind belief and support in a single man is scary, actually, and doesn’t help with the reputation of Penn State and Penn Staters. And this cult of football has to stop. The football team should exist for the school, not the school for the football team. The people who are still holding on to the fragments of Paterno’s reputation are missing the whole point of this whole debacle: children were systematically abused and allowed to be abused. What I remember about Penn State, what I love/loved about Penn State, were the professors I had who shaped my career, how I thought about my work and art, and how they made me a better person. And I remember my friends–the people with whom I matured, with whom I grew up, and learned from and with. To me, this is should be foremost in anyone’s university//college experience. The athletics should be icing on the cake, not the cake, icing, and ice cream, and cherry on top.